Australians! ‘Matilda and Me’ will air on ABC TV later this year! 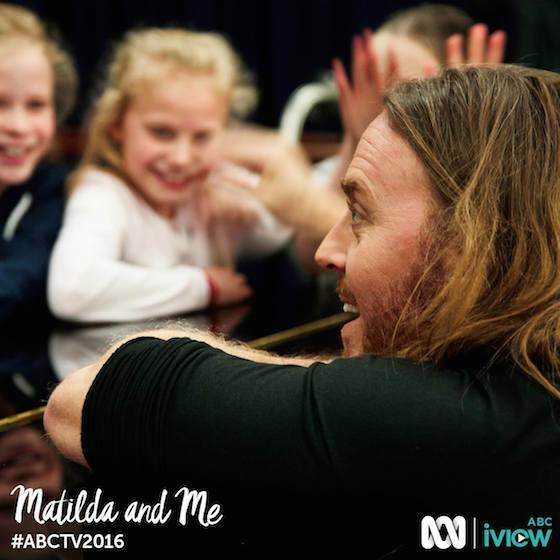 Charting the intimate relationship between Tim and the multi-award-winning musical, for which he is now internationally known, Matilda and Me is a family documentary which will air on ABC TV later this year. The rehearsals for the highly anticipated Matilda The Musical in Australia form the backdrop to the story, as the new Australian cast prepare to launch the show in Sydney. Directed by Nel Minchin and Rhian Skirving, the film looks at Tim’s long-term fascination with author Roald Dahl and at how he went from being a virtually unknown lyricist and composer, in Australia, to debuting his first musical on a West End Stage. There’s a mix of archive footage (including rare family moments), interviews, musical performance and Australian Matilda The Musical rehearsals. Specially shot footage of Tim globetrotting between LA, London and Sydney, culminates with his return home for the triumphant opening night of Matilda The Musical in Australia. Matilda and Me is an ABC TV/In Films co-production. We’ll announce the air date as soon as it’s confirmed. There’s no word yet as to whether this will become available outside Australia but, as always, we’ll let you know if we hear anything.